Imagine yourself in Africa, standing alongside a Kenyan farmer during harvesting season. The sun beats heavy on the farmer’s back. He scans carefully for any sign of hope among his crop. What insects haven’t destroyed, the sun has scorched. How many must go hungry because of this loss? now a postdoctoral researcher in the college. This is a problem that plagues people from all over the world. But could there be a solution to protect his crops so his family and many others don’t go hungry? 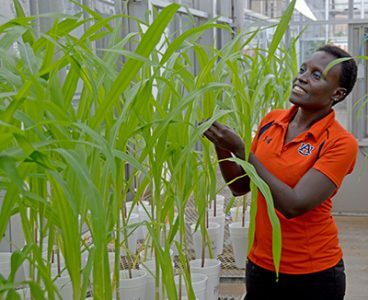 One such solution was discovered within the soil by Esther Ngumbi, a world hunger advocate and a postdoctoral researcher in Auburn University’s College of Agriculture. During her time as a doctoral student, she discovered that microscopic bacteria living in the soil (soil microbes) can change the chemistry of a plant so that it repels insects. Her research led to a U.S. patent and to companies pursuing rights to create commercialized products. She didn’t stop there. But her work goes far beyond her research. She is a Food Security Fellow with New Voices and The Aspen Institute, and she has also served as a Clinton Global University Initiative (CGIU) mentor for agriculture. Additionally, she has been involved in Universities Fighting World Hunger. Born and raised in Mabafweni, Kenya, Ngumbi experienced harsh living conditions. She grew up going to the farm every day, walking to and from school. She is the only woman from her community to earn a PhD. Ngumbi said her dreams of being an accountant were finished the moment she discovered science in university. After completing her bachelor’s and master’s degrees in Kenya, a friend convinced her to pursue a doctoral degree in the US at Auburn University. With the help of associate professor and integrated pest management specialist Henry Fadamiro, Ngumbi discovered ways to help farmers protect their crops. Ngumbi’s resourcefulness and innovative thinking drive her to search for solutions to problems like world hunger and poverty. Ngumbi says she believes education is the answer, and she hopes to provide other children from her country the same kind of opportunities she has experienced. In addition to her research on crops, Ngumbi pours most of her time and energy into the development of a school she and her parents pioneered in Kenya called Faulu Academy. “Faulu” means success in Swahili. Ngumbi speaks nationally at events and conferences to share about her work in entomology and about Faulu Academy. Faulu Academy, originally built from mud, now educates 94 students from elementary to grade seven. Ngumbi says her parents informed her there may be 26 new students soon. The school has grown from one building to a compound, and she plans to continue expanding. She hopes to gain more support so more students can attend the school and experience a 21st century learning environment. Ngumbi commends the Auburn Family for their support and participation. Former Miss Auburn Tara Jones helped collect money from the Auburn community to build a well for Faulu Academy. Additionally, The Women in Science and Engineering (WISE) donated six iPads for the school’s use. Ngumbi says she dreams Faulu Academy will one day be an institution like Auburn, and she believes Auburn has the resources to help build the next portion of the school, a science lab. She hopes the lab will give students the opportunity to fall in love with science the same way she did when she was at university. Ngumbi reiterates that her life is truly dedicated to giving back and investing in others. She feels there is poverty all around, but she dreams of a world that doesn’t look as bleak in the next 10 years. Because of what education has done for her, she hopes to instill its importance in the young minds at her school. Her message is simple: Education is an extremely valuable tool, and she envisions a world where everyone is provided an opportunity to take flight. For graduate students, she reminds us that education is one of the most important assets that can sometimes be taken for granted throughout the journey.